The project is going quite well, but has been as time consuming as any project I’ve done. The big fear in this of course though is the inability to test as I go, which is making for some potential hellish troubleshooting sessions which may mean a lot of de-solder/re-solder processes. This of course is because without a cartridge slot in place, I have to have the games hardwired before I can even begin testing, not to mention the power and signal wires needing to be run to the system and screen. If this works on the first try it’s going to be a miracle, but I’ve been vigilant on how my connections are being made and what’s around them. The picture below shows where my current progress with the board and games stand. 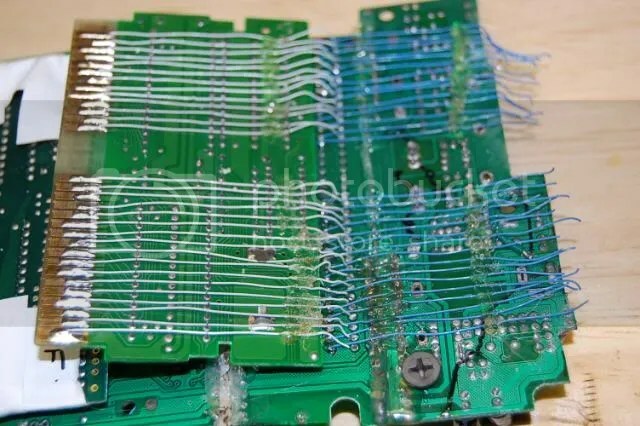 But as you can see, the game is going to lay right over the cart pins so once it’s soldered in place, getting to those pins is going to be next to impossible without a lot of repeat soldering. As always, check out the full progress work log on MBB!